Shortly after finishing his Bob Seger number, Tillerson reportedly dashed into the John Quincy Adams State Drawing Room, hopped on the desk where the Treaty of Paris was signed, and struck several power chords on a flagpole. 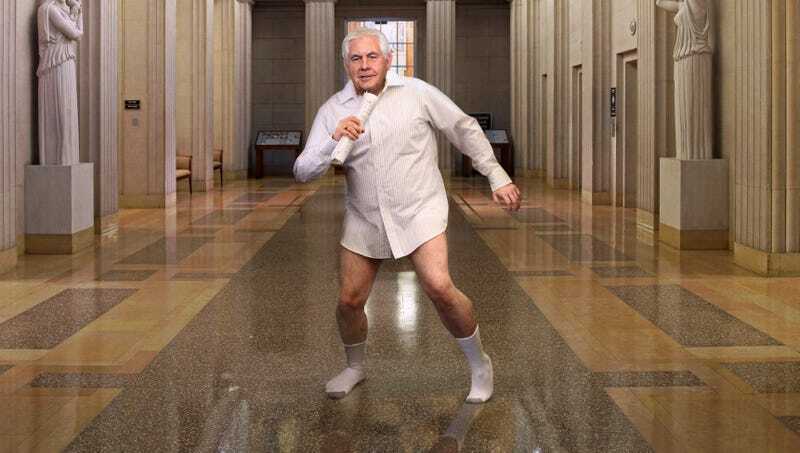 WASHINGTON—Leaping out from behind a wall as Bob Seger’s “Old Time Rock and Roll” blared from the building’s intercom, a pantless Secretary of State Rex Tillerson slid across the waxed marble floors of the completely empty State Department, sources confirmed Wednesday. The nation’s top diplomat, clad in only a dress shirt, white tube socks, and a loose-fitting pair of briefs, was reportedly seen performing a variety of spirited dance moves throughout the labyrinth of abandoned offices and conference rooms, singing along into a rolled up foreign policy paper that also doubled as a makeshift saxophone. Sources confirmed that after realizing he was the sole occupant of the Harry S. Truman building at approximately 1:30 p.m., Tillerson first began entertaining himself by dancing on a computer terminal in the vacant Office of Emergencies in the Diplomatic and Consular Service, later tying a necktie around his head and commando-crawling through a maze of tunnels he built using furniture from the John Quincy Adams State Drawing Room. The 65-year-old then reportedly arranged stacks of correspondence from the Office of the Undersecretary for Arms Control and International Security, which he positioned as bowling pins and attempted to knock down with a rolling swivel chair. Sources confirmed the Secretary also soiled and ruined several Persian rugs by crouching in a half-full mop bucket and spraying a fire extinguisher as a rudimentary form of propulsion. “Also, climate change is real!” he added, slamming down the phone and filling his mouth with whipped cream from two canisters simultaneously. According to sources, Tillerson spent much of the afternoon shredding official documents, including the justification for the use of military force in Syria and the formal resignation from the Paris Climate Accord, whose remains he tossed into the air like confetti. Sources reported that he also commandeered a framed map from the Diplomatic Reception Room to sled down the vacant stairwells before pressing all the elevator buttons and racing it back to the building’s top floor. In addition, sources said that at one point, while duck-walking through the Edward Vason Jones Memorial Hall, the former ExxonMobil CEO tripped and crashed into a marble bust of George Washington—on which he had previously drawn a handlebar mustache—knocking it to the floor and shattering it. He then reportedly grabbed the pieces and brought them to a nearby window, alternately yelling “tally-ho!” and “I’m bored” as he heaved each of them onto the sidewalk. At press time, Tillerson was mooning a busload of Taiwanese tourists when U.N. ambassador Nikki Haley walked in.